For sure your eyes are a valuable commodity that you do not want to be without. You wouldn’t run a chain saw in total darkness would you? Why would you plan to do that very thing by not considering safety glasses anytime there is potential for eye injury? One unexpected, unplanned event (accident) and you possibly won’t run the saw in daylight again. It will definitely slow down saw operations for all time. 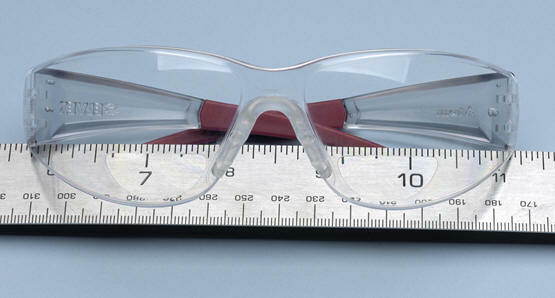 When operating a saw, trimmer, clearing saw or just performing maintenance or sharpening -safety glasses must be worn. The potential for eye injury is present at all times when undertaking these tasks. I just started a small engine in the yard one day and a piece of rust from the exhaust muffler blew upwards into my eye. It had enough force to pierce the edge of my eye and the doctor had to remove it with what seemed to be a magnetic drill bit. Yes, if it sounds gross to you-- I can tell you it’s not a pretty sight when it’s headed toward your eyeball either. I never knew how closely related your eye is to your stomach as nausea set in quickly. Safety glasses today from companies such as Elvex, who have improved the manufacturer of hard polycarbonate coated lenses, are completely distortion free affordable lenses. These safety lenses can be clear, indoor/outdoor, yellow, grey and dark tints that all block dangerous UV’s and protect your eyes from HFO’s (harmful flying objects). Safety glasses now have coated lenses that have scratch and fog resistance. There are also cleaners with anti-fog properties that can help prevent collection of facial oils and moisture that immediately make fogging a problem. On the web one product called C-Clear is getting high reviews. Since the time I turned forty-two (thirteen plus years ago now) I have been wearing two sets of eyes. I tried to make it through with just regular safety glasses but no way to see anything up close. Contact lenses are just not for me either, especially with all the dust I am around. So, I tried a couple safety glasses with bi-focal inserts and also the plastic film inserts on the market for about a year. They just didn’t offer a solution, too much distortion and I always seemed to get a headache. I decided to spring for a pair of prescription safety glasses and sprung I did to the tune of about $240. I really used them too long, about three regular eyeglass prescription upgrades and then last year I paid $380 for a new pair. In January I received a pair of Elvex RX 400’s in 2.0 magnification bi-optics. The soft ear pieces sealed great under the ear muffs and the lenses are so clear. I wore them for less than a day to find the bi-focal optics worked great whether walking in the woods, sawing or sharpening. The cost a fraction too… Safety glasses with bi-optics are available with magnifiers ranging from 1.0 to 3.0 to accommodate most reading and work environments. So, the excuses are reduced to a minimum by the aforementioned paragraphs. The need for safety glasses is indisputable when tackling power equipment operations. You can now find products available that will work for you. Try it please-- do so for more than a couple days, give them an honest try before abandoning them and remember for many occupations it’s the law. Your Two Specs are worth the time, effort and money expended to protect and keep them! If you have any questions about the items mentioned in this article please send them to info@forestapps.com. Links can be found to explore on our website and eStore at www.forestapps.com. 1 In the workplace these items are part of the PPE requirements of a chain saw operator under OSHA 1910.266. Make sure you are in compliance for two reasons- your safety and it is the law.